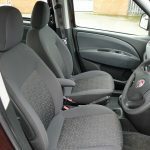 What Type of Wheelchair Accessible Vehicle Do I Need? How easy is it to use a WAV? 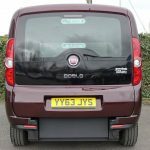 A 1.4 cc petrol engine Doblo in a lovely blackberry colour that has a lightweight, one-piece ramp with a very generous width of 33 inches! 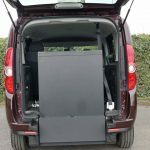 The conversion is by Gowrings and the car adapted with a lowered floor to create the internal height required by a wheelchair user to fit in comfortably when travelling around. 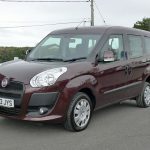 The wheelchair is secured in the vehicle utilising the four point wheelchair restraints which include inertia belts in the front that have the added safety of a no rollback feature. 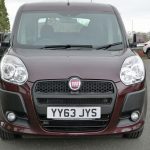 If you are new to this type of vehicle we have included on this website (in the ‘Advice’ section above), a video providing you with a demonstration of how easy it is to use a wheelchair accessible vehicle. 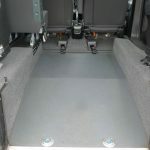 You will see from this that the wheelchair is fastened very securely in the wheelchair location and all that then needs to be done is to click the safety belt around the wheelchair user and the process is complete. 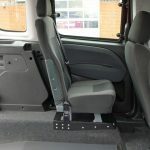 The rear seat can also double up as somewhere to place any essential items required by the wheelchair user. In the front cabin there is an overhead storage shelf and this is very useful to store any valuables out of sight or quite simply somewhere to place items so as to keep the vehicle nice and tidy when out and about. Some handy drinks holders in the front plus the drivers seat can be height adjusted to ensure that the position is correct for them to drive comfortably. 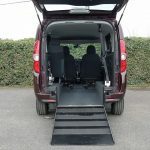 A wheelchair accessible vehicle that ticks all the boxes and enable a wheelchair user to escape the house and get out and about in safety. 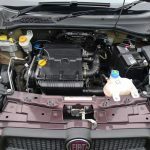 All of our quality vehicles come with 12 months MOT, 12 months warranty and all are serviced and valeted in our very own state-of-the-art Service Centre (see inset) before being delivered to their new homes. 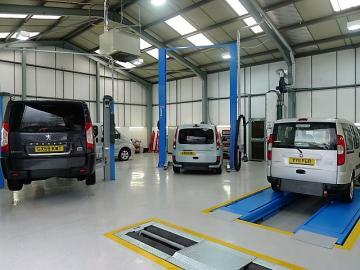 Unsurpassed vehicle preparation in our own main dealer standard facilities. Mobility Nationwide has some of the best vehicle preparation facilities in the country. Thank you for your interest in this vehicle. Viewings are on a no obligation basis, and are available throughout the UK*. * Please note that for customers who are in remote locations that require ferries, flights or overnight accommodation; we may - on the rare occasions - ask for a small contribution towards our expenses. All viewings at Mobility Nationwide’s discretion. Please be assured that we will not, under any circumstances, share your data with anyone for marketing purposes and you will not receive offers from other companies or organisations as a result of giving your details to us. WHAT INFORMATION DO YOU REQUIRE? 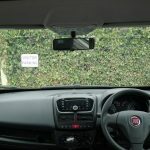 ALL OF OUR VEHICLES CAN BE VIEWED AT YOUR OWN HOME. 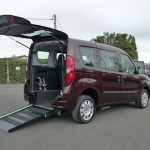 Mobility Nationwide is home of quality used Wheelchair Accessible Vehicles. We’re always delighted for people to visit but if please call in advance to arrange an appointment so we can ensure one of the team is free for you.